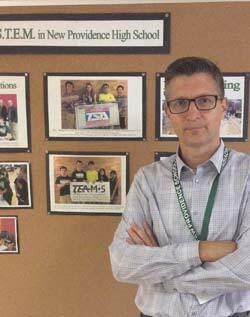 Starting in September of this year, the newly established role of New Providence’s department head of STEM (STEM standing for Science, Technology, Engineering and Math) is being taken on by Jon Keaney, a highly respected Science teacher and previous Science department head at the New Providence High School. This role was established after two years of ongoing dialogue Dr. David Miceli, Superintendent of New Providence schools, had with various constituents around STEM — a topic that seemed to come up in almost every conversation and forum. Dr. Miceli shared that he had expressed to the Board of Education last year he “really felt the need to create a position that had a total focus on STEM…in essence a person who would be the focal point and directly be the face of STEM so that greater communication and collaboration could occur.” Though STEM efforts in the New Providence schools existed in various aspects and there were many people invested in STEM activities, all these efforts were not coordinated. A central individual could really help to bring people and efforts together as well as collaborate with outside agencies and industries to maximize and promote all these activities. As head of the STEM department, one of Mr. Keaney’s primary responsibilities will be coordinating and collaborating with the New Providence department heads of Science, Math, Technology and other related subjects to examine the current curricula structure and to find opportunities to coordinate and integrate together those subjects. For this K-12 integrated curriculum goal, the aim will be to ensure that there are as many prospects to bring together a variety of different subjects. Said Mr. Keaney, “All the research shows that students tend to learn best when they are studying integrated subjects… connecting together common ideas and content learned in a variety of subject areas and leading to the development of critical thinking skills.” He will look to work with what the schools already have as well as seek new ways to combine the variety of subjects together to create the long-term coherent STEM program. In addition to developing the STEM school curricula, the envisioned STEM program also consists of organizing, encouraging and developing STEM clubs within all four New Providence schools. Starting in the fall, there will be STEM clubs at the high school, middle school and both elementary schools which will give students opportunities to engage in problem solving, engineering, STEM related activities after school. “The Board was very generous in allowing us to create club advisors in all 4 schools and build it into this year’s budget” shared Dr. Miceli. A component of the clubs will be entry into variety of competitions, building upon the competitions already being entered by New Providence students who have achieved respectable accolades. Mr. Keaney’s focus will be finding more competitions that integrate together Science, Technology, Engineering and Math. STEM clubs moving forward will have advisors from all the different components– for example in high school, there will be broader support with advisors from Math, Science, Design and other areas who can help the students in the various competitions. “The advisors’ tremendous time and dedication really make a difference in encouraging students to get involved with external competitions” said Mr. Keaney. When asked what his longer-term vision was for STEM in New Providence, Mr. Keaney responded that though he may have an initial framework in mind, the valuable input, insight and involvement from faculty and community was crucial to developing a truly successful longer-term STEM program for New Providence. This developmental process is already underway and will continue over the next year. Mr. Keaney further shared, “The high level vision in 5 years time is to achieve a very comprehensive, integrated STEM program where starting from kindergarten, students are introduced to age and grade appropriate real world and meaningful STEM problems and continuing through the middle grades, they’ll be exposed to units that allow them to use all their STEM skills to solve a whole variety of engineering and design challenges. As students enter the high grades they will have the opportunity to take STEM electives that address some of the major global and real world STEM challenges of the 21st Century. Lastly, Mr. Keaney shared some thoughts for community involvement including having a community resource where teachers can leverage specific experts to come in for particular topics being discussed in classes. Another idea was seeking community involvement and forging industry partnerships for curriculum development and external competitions, ranging from sponsorship and support to securing judges for New Providence hosted competitions. “In order for this initiative to be successful, the community definitely needs to be involved”, said Mr. Keaney.